They came near the town of Emmaus and Jesus acted like he did not plan to stop there. But they wanted him to stay. They begged him, "Stay with us. It is late; it is almost night." So he went in to stay with them. Jesus got ready to eat with them and took some bread. He gave thanks for the food and divided it. Then he gave it to them. At that time, the men were allowed to recognize Jesus. But when they saw who he was, he disappeared. The two men said to each other, "When Jesus talked to us on the road, it felt like a fire burning in us. It was exciting when he explained to us the true meaning of the Scriptures." So the two men got up then and went back to Jerusalem. In Jerusalem they found the followers of Jesus meeting together. The eleven apostles and those people that were with them said, "The Lord (Jesus) really has risen from death! He showed himself to Simon (Peter)." Then the two men told the things that had happened on the road. 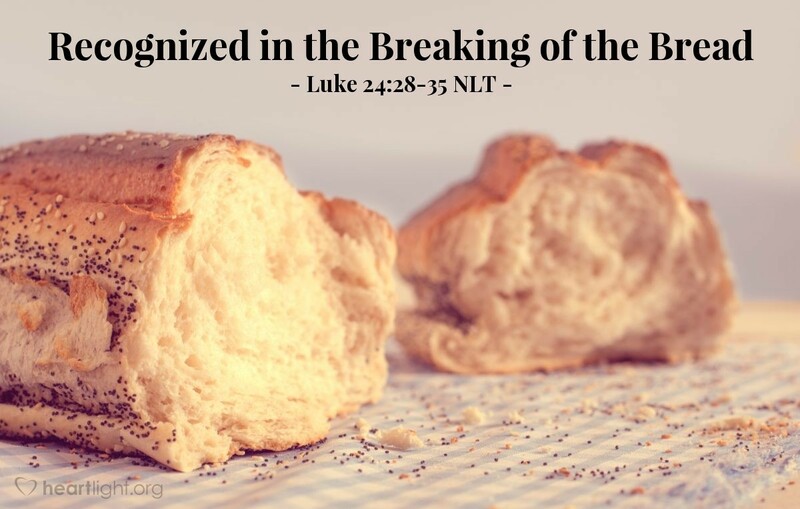 They talked about how they recognized Jesus when he divided the bread. Every meal is sacred when Christians share it together. When we share the Lord's Supper, we are most certainly to recognize the presence of the Lord with us. This meal, however, is a reminder that even the most common times of table fellowship are sacred and precious moments of Jesus' presence. When we eat together, let's never let a single meal pass without our conscious realization and recognition of the Lord being with us. Holy Father, thank you for making meals sacred moments with your Son. Forgive me for trivializing mealtime with my brothers and sisters in Christ. I confess that I get so busy and rushed that I often miss the opportunity to welcome the Savior into our fellowship. In Jesus' name I pray. Amen.